To Barbara Wootton, sociologist and criminologist. From June Westley. You were the first, or one of the first, women to do so many things - tech at Cambridge, where they wouldn’t give you a degree, one of the first women in the House of Lords. You were involved and instrumental in so many developments in the law & social conditions, working for example, with Aneurin Bevan on the development of the welfare state. How did you find the energy? 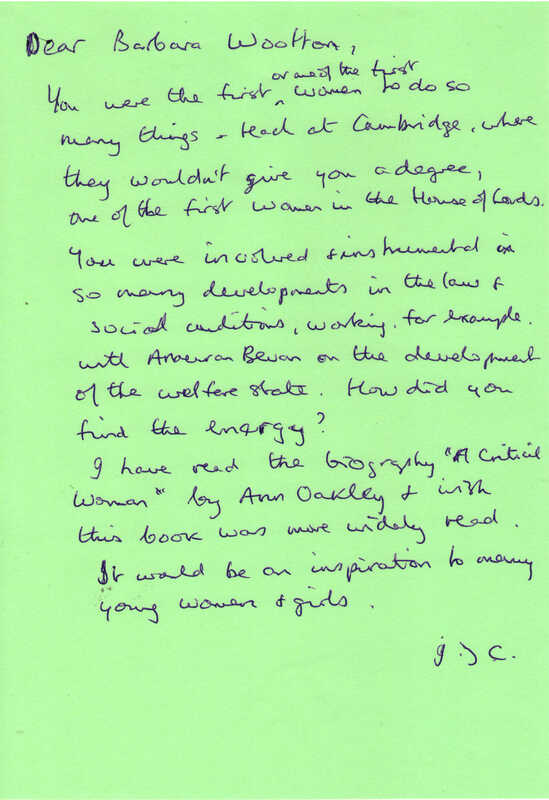 I have read the biography “A Critical Woman” by Ann Oakley & wish this book was more widely read. It would be an inspiration to many young women and girls. sociologist and criminologist. Born 1897, died 1988. More information about Barbara Wootton.